There are several Mount St. Helens visitor centers located along State Highway 504, which is the main route into the National Volcanic Monument. Each offers different educational exhibits and viewing opportunities, along with shops, refreshments, and restrooms. Most offer access to trails. The best way to experience the mountain is to spend at least an entire day driving east on Highway 504, stopping at visitor centers, trails, and viewpoints along the way. The extent of the devastation—obvious even decades after the 1980 eruption—unfolds with each mile. Yet you will also see nature's amazing recovery, plants, and animals of all kinds. If you only have a short time to spend on your Mount St. Helens visit, the visitor center at Silver Lake is located just off Interstate 5 and offers excellent exhibits and a moving film. If you have time to drive all the way in, but can only stop at a single visitor center, choose the Johnston Ridge Observatory. Note: Volcano viewing is highly dependent upon the weather. 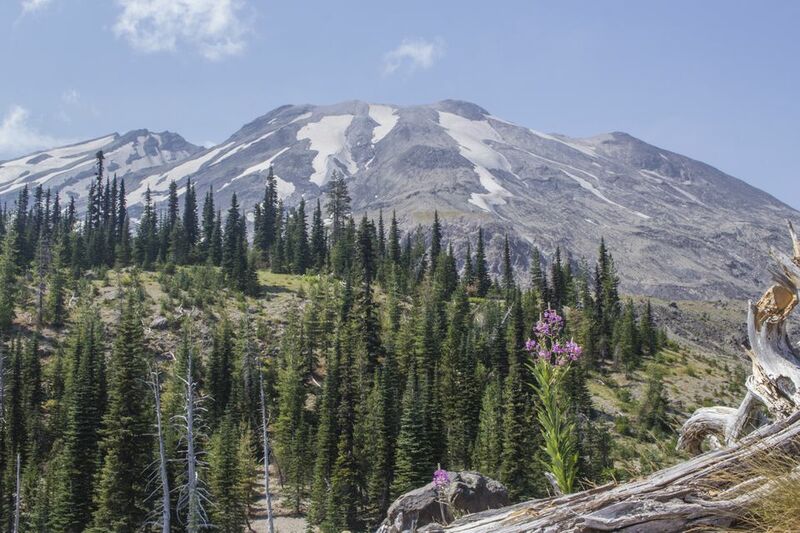 However, if visibility does not allow a view of Mount St. Helens itself, spending time in the blast zone, visiting the centers, and hiking along interpretive trails is still an experience of a lifetime. The Mount St. Helens Visitor Center at Silver Lake, located five miles from the I-5 exit at Castle Rock, shows a powerful and moving 16-minute film detailing the events around the May 18, 1980, eruption. Exhibits provide information about volcanoes, comparing the Mount St. Helens eruption to others of historic significance. Adjacent to the center is the half-mile Silver Lake Wetlands Trail, where you can learn about the formation of Silver Lake and the plants and animals that live there. On clear days, Mount St. Helens can be seen in the distance. This center also offers a book and map shop, and the staff is available to answer your questions. The Charles W. Bingham Forest Learning Center at Mount St. Helens is sponsored jointly by Weyerhaeuser, the Washington Department of Transportation, and the Rocky Mountain Elk Foundation. Visitors will learn about forests and forestry management. A significant amount of the forested land in the blast zone was owned by Weyerhaeuser; exhibits at the center address the timber salvage and forest recovery activity that Weyerhaeuser has conducted since the eruption. Other attractions include multimedia presentations, an elk viewpoint, a volcano-themed playground, a forest trail, and a gift shop. The Charles W. Bingham Forest Learning Center is closed during the winter. The Coldwater Ridge Visitor Center was permanently closed on November 5, 2007. In 2012, the facility reopened as the ​Mount St. Helens Science Learning Center and now offers field trips and educational programs and is available for meetings and conferences. Programs for kids, adults, and entire families are presented by the Mount St. Helens Institute, which operates the Science and Learning Center in cooperation with the USDA Forest Service. These programs include guided hiking and climbing trips ​as well as hands-on, outdoor geology or biology learning experiences. Geology and biology are the focus at Johnston Ridge Observatory inside Mount St. Helens National Volcanic Monument. Operated by the U.S. Forestry Service, the Johnston Ridge Observatory is the visitor center closest to the volcano and offers stunning views into the crater as well as the surrounding eruption-altered landscape. A wide-screen theater presentation concludes with the drapes being opened to reveal the view through a windowed-wall. Exhibits take you through Mount St. Helens' geologic events, and you can read the eyewitness accounts of the eruption and ​​its aftermath. The Johnston Ridge Observatory is closed during the winter.